I really enjoying cooking. I have so much fun pouring over cookbooks to find the perfect recipe to try. I especially become super obsessed with cooking during the Summer. Maybe it’s the heat, but I find myself wanting to pull out a new favorite cookbook almost everyday and get down to it. For all things in the realm of tasty tacos, I always go to my favorite Tacolicious cookbook. Tacolicious is actually one of my favorite restaurants in San Francisco and I have always wanted to know the secret behind their tastiness. I was so excited when they came out with a Tacolicious cookbook. All things taco tasty! I’m also super obsessed with Lousisana cooking. Delicious seafood and an array of Cajun spices is definitely not something I can say no to so I love to pop open my Cooking up a Storm and Down South cookbooks. For delicious desserts, I have been turning to southern favorites, The Southern Cake Book and The Southern Pie Book. Seriously, so delicious! Do you have a favorite cookbook? Share with me in the comments! 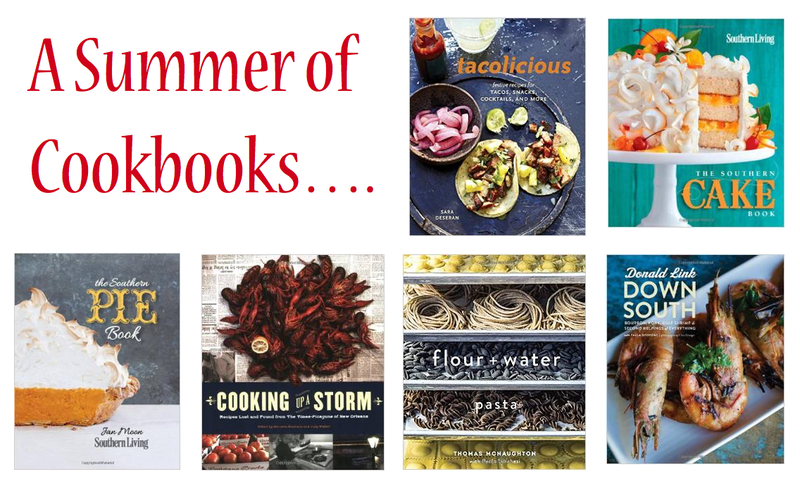 I love your cookbook choices for the summer. I'd like to do some more Mediterranean & Greek cooking this summer, so I have to find a few good cookbooks for that! I would love to read Tacolicious, but my husband would love for me to read the Down South cook book. He's from South Carolina and misses the food from there. I use a family cookbook from Williams-Sonoma quite a bit. It has meal plans with parts that the kids can help with. These are great selections. I suspect I would like the Tacolicious cookbook since we eat some variation of a taco dish every week. Love your Taco cookbook and you can never go wrong with a Southern Living cookbook about cake! !